I decided to test it out on a West Mountain CBA IV battery analyzer mainly so I could see the discharge curve everyone brags about on these batteries. Below are the results. You can see that the discharge is much flatter than a lead-acid battery and the steep drop off at the end of life. At the end of the test you can see the voltage dropped to zero! That appears to be a function of the battery management board built into the battery module. As soon as the charger was plugged back in the battery woke up. 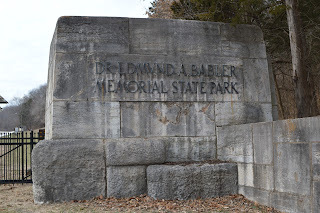 Sorry, I couldn't resist using this title as this weekend was both the South and North Carolina QSO Parties. I didn't do much score wise for these events but it was nice to get back to working QSO Parties from home. Operation was mainly 40 meters and I was hoping for more on 80 meters but I may need to check out my vertical antenna. It has never been very good on 80 but something seems worse now so it is time for some antenna maintenance. The antenna is a 33ft antenna from DX Engineering and I will be looking into adding 10 feet to it and maybe install my LDG-100 remote tuner. 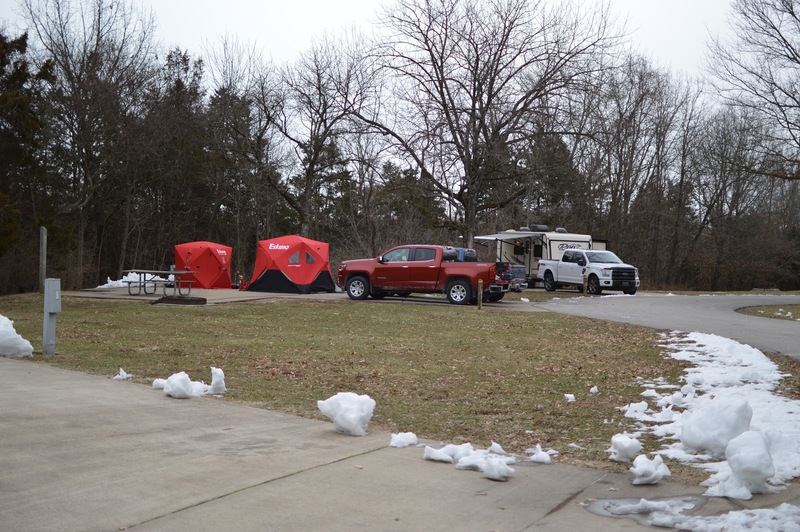 We went with the same basic plan as last year meaning we would set up at the same location with the antennas basically the same as last year. 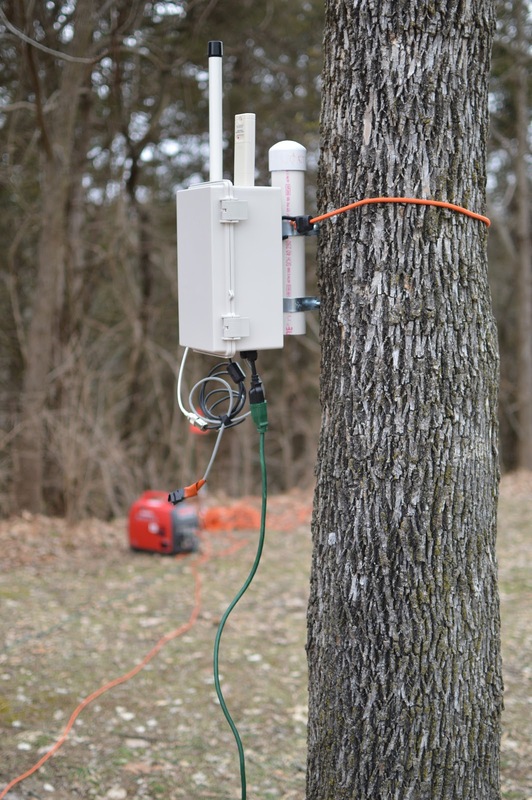 The second year at the same location goes so much easier as you know which trees supported the Windom antenna as an example. We went with the 10-80m Windom and the 80 meter loop as our main antennas. 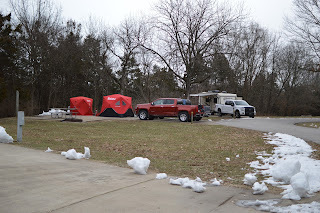 Friday night we got the pull strings in the trees and the camper leveled and plugged in so it could warm up. On Saturday we had 2 people available to start at 8AM by getting the Windom antenna in the air. We tried an untested inverted L as a multi-band antenna with the primary goal being a way to get on 160 meters. I use this same balun on my inverted L at home but there is definitely a sweet spot when tuning it and we did not have time to mess with it any longer so that will get tested once it warms up. Plan B was to put up the 80 meter loop we used last year. 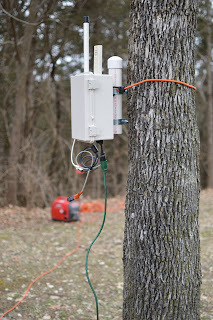 After the antennas were up we set up the generator, access point, and shelters. 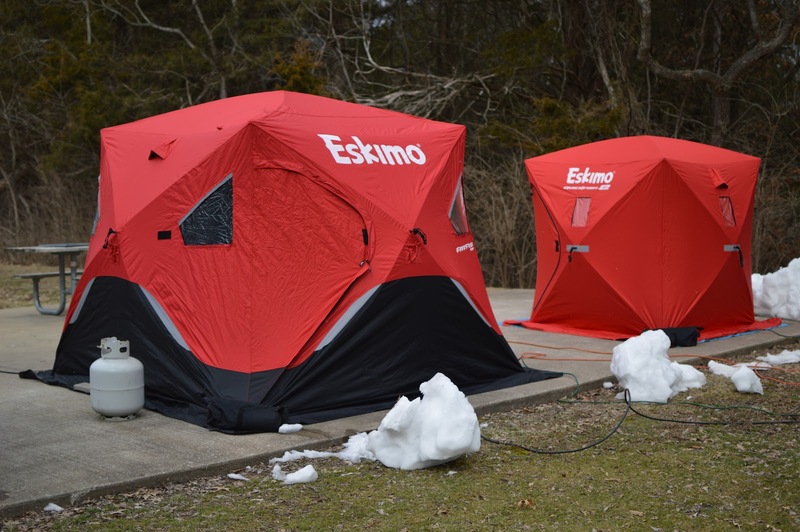 We added another ice fishing tent this year as it should be easier to heat. We also put thick moving blankets on the concrete pad first before putting the shelter down. This seemed to greatly help the heating issue and I know my feet were warmer this year! The shelter you see on the left held 2 operators and the one on the right was for a single operator. We had the normal PC issues just before the contest started such as N1MM needed updated again, working through the error messages and finally getting the section entries to be accepted. We got on the air about 20 minutes late but we were off and running. One operator working on phone contacts while the other one knocked out some multiplier hunting. We got some relief in the evening when AE0TT came to help out and he had some good runs on 80m phone. By Midnight pretty much folks were in bed for the night. We still need to solve the night shift operator issue but I am not sure there is enough activity to keep someone awake. Sunday morning I woke up to the sound of sleet hitting the camper which made it hard to get out of bed but things needed to get started again so we got up and started the generator and turned on the heat in the tents. AA0Z began operating while the eggs were cooking. 2 operators finished out the event and we started tearing down. My son Simon came to the park to help tear down antennas and tents plus he helped haul stuff back home. Thanks Simon!